We asked for everything to be cooked fresh. They served use foodnthst was under a heater for a while. Would NEVER go back to this crap hole again. Gross. Indigestion central. 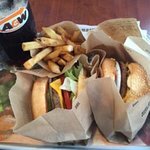 The new Maple Ridge A&W has the best customer service! Very polite! I hate fast food. But i will eat here. They have the new vegan beyond meat burger. I ask for no mayo or uncle sauce and its better than most restaurants. Its super clean. They told me they take extra care to scrape the grill clean for vegan burgers. Im vegan due to animal rights. I see this restaurant giving good efforts forward with better products including recycled napkins. The only fast food restaurant I will eat at. And this Maple Ridge branch....very very lovely staff. Thank you. A great location to grab a quick breakfast. Tasty food and helpful customer service. Buddy burgers are not bad at all. Okay being a veggie going to a fast food burger joint is unlikely. However when A&W announces the “Beyond Meat” veggie burger I had to try. I was a little apprehensive and thinking yeah right another sawdust burger with ketchup yum. I was blown away aside from my homemade black bean burger this hands down was the best veggie burger I have ever tasted. 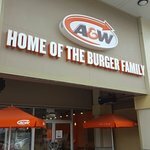 Way to go A&W I will be back!! Relaxing atmosphere, very clean with friendly service with good food and outside tables with umbrellas. Been to A&W Restaurant? Share your experiences!